I am 95% “Meatasaurus” and 5% “Vegisaurus” which mathematically means I am no part “Vegansaurus” and that math works for me since I adore my meat. As for dairy, fruit and veggies… I can’t see living without them but I also can’t see having a strict diet of them but to those who can live on a strictly vegetarian diet I doff my hat to you. With that being said I recently found myself contemplating a veggie dinner more out of necessity than any other reason. It was between grocery shopping days and there was no protein (read meat) in the house…… besides I was to lazy to go out and get some so after peering into the pantry for what seemed like an eternity a plan was formed. I would use up the rest of the Quinoa and add other little goodies to it. 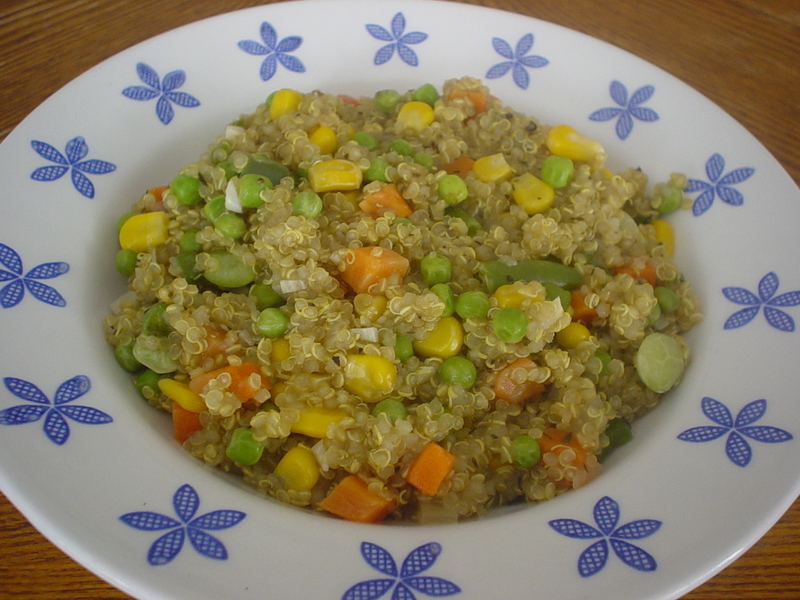 Now for those of you who may not be familiar with Quinoa it is simply a grain that is cooked similar to rice and, in my humble opinion, is every bit as good as rice but is oft times overlooked as a substitute for rice or other starches AND Quinoa absorbs whatever flavors are added to it so that makes it very versatile. Meanwhile, in a large sauce pan heat the oil and saute the garlic and onion until the onion is translucent— approx. 3 mins. Add the remaining ingredients to the garlic and onion and continue sauteing until the veggies are heated through. If need be add a little water to the veggies. Once the Quinoa has cooked add it to the veggies and mix well. Spoon into a bowl and enjoy. Also feel free to add whatever protein you like. I would suggest chicken or shrimp.